From Our Bookshelf: Why Does Izzy Cover Her Ears? Why Does Izzy Cover Her Ears? is a thoughtfully written children’s book by a school based occupational therapist. 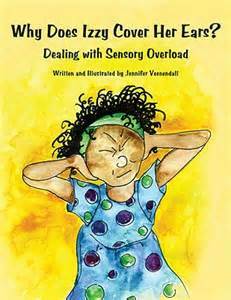 It is told from the perspective of Izzy, a first grader with sensory processing disorder (SPD). Izzy finds many everyday sensory experiences, from the sound of peers talking, to being bumped in the hallway to be completely overwhelming. Izzy is able to explain how her sensory system reacts in concrete, easy to understand language. so I defended myself by hitting. The majority of the book is focused on the environmental changes and sensory diet activities that help Izzy to better cope with her classroom and be an active and happy learner. Her teacher is flexible and adjusts the decorations in the room and allows Izzy to switch the location of her desk. Izzy uses simple adaptations such as earplugs when she needs them and she discusses activities that help her with regulation in the class and in the OT room. This book would be an empowering resource for elementary school aged children who deal with sensory over-responsiveness. A child with SPD may feel that he or she is the only one who struggles with the way things sound, feel or move, but this book may help to show that there are many children who experience the world in this particular way. This book would also be useful for siblings or friends of a child with SPD, to help them be more understanding and supportive. Why Does Izzy Cover Her Ears? is a must read for any family with a child with sensory sensitivities. Distress during nail clipping is one of the everyday obstacles we hear about from many of our families. Some children have trouble tolerating the clippers, some dislike the sharp feel of the nail after clipping, or the novel tactile input on the fingertip that was previously covered by the nail. Here are some ideas to try next time the clippers need to come out. If your child likes to play with resistive materials like theraputty or play doh, have him use the materials before nail clipping as a way to “warm up” the fingers before the task. Or, let him hold a vibrating massager to provide vibration to the fingers. Offer these types of materials after the trimming as well. Try a lotion massage on the hands, using firm stroke with your whole hand (not just fingertips pressing into your child’s hand). End with deep pressure gently “pulling” down the length of each of his fingers, toward the nail. Nails will be softer and easier to trim after bath time. Use child-friendly terminology – don’t say you are going to “cut” the nails, use words like “trim”. Children may associate “cut” with pain. Have your child be in charge of counting each nail that is trimmed. Counting will help him see that the process will not take forever. Singing a song together may help as well. Try the tune of “Here we go ‘round the mulberry bush” and change the lyrics to “This is the way we trim your nails”. Some children prefer the vibration and pressure of a nail file rather than clippers. At first, a successful nail trimming may be one hand at a time, or even one nail. Find the level where your child can tolerate the process without being overwhelmed and build from there. Teach your older child to safely trim his or her own nails. Sensory input that he controls may be easier to tolerate than imposed input.